The market decided to go up instead of down... : ) My count became void on the 28th of April after 862 was breached. I sold all my puts at that level with 9 points loss (853=>862). We are now in the last upleg of the current rally. 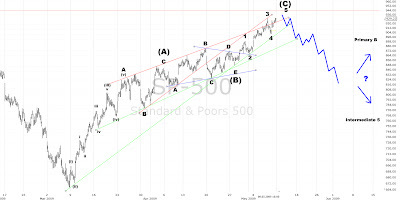 Wave 5 of (C) should end soon since we are right below some heavy resistances: There is the January high at 944, the SMA 200 at 955 and the 38.2% retracement of wave 3 at 961. I expect the market not to surpass this levels. After the market will have topped out between 930 and 960 we should see at least a 38% correction of the entire up move. A break of 900 will confirm that this rally is over. wave 4 or Primary B? As long as we don't correct more than 62% of the rally from 667 to 9xx I expect us to be in Primary B and we should see higher highs in the summer. If we drop below the 62% retracement we'll likely be in Wave 5 of A/1 and should make slightly lower lows in the summer.